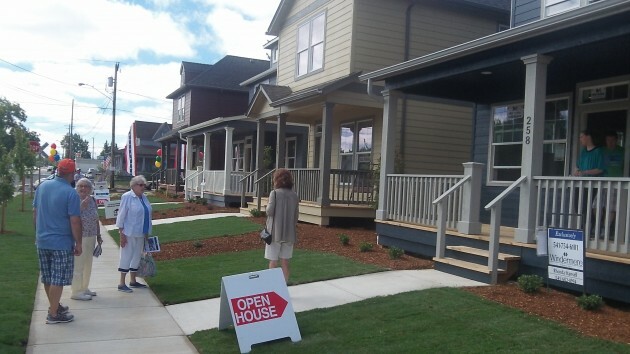 Visitors check out the first finished houses at Edgewater Village Saturday. After checking out the interior of the first units in Edgewater Village over the weekend, I’m encouraged about the prospects of this, Albany’s biggest investment yet in reviving a blighted part of the old downtown. The houses were open to the public Saturday and Sunday. 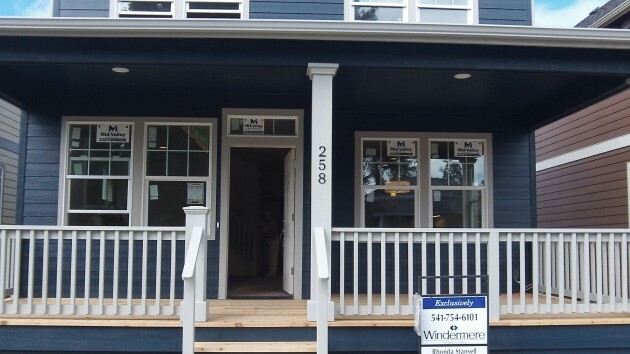 Priced from nearly $256,000 for the smallest, at 1,546 square feet, they appear to me to be attractive to people looking for comfortable living in well arranged and appointed spaces without a lot of yard work and within walking distance to restaurants in the old part of town. Or at least biking distance. Five houses have been all but finished, and two of them had signs saying “sale pending.” One of those will serve as the sales office unless someone else wants to buy it, in which case the developer, George N. Diamond, told me he’ll move the office into it. 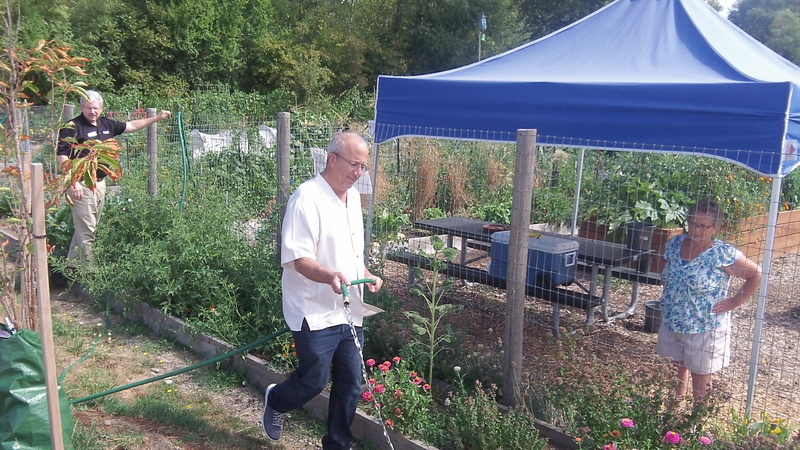 Diamond spent part of Saturday watering the young trees he had planted on the path between the development and the Willamette Community Garden. The completed units are the first of 19 shown in the plans for Edgewater’s Tract A. I asked Diamond about building more units, especially along the river, and he told me he’s getting bids on construction. The plans show units 6 through 13 to be similar to the first five. But units 14 through 19, facing the Willamette River across the Dave Clark Path, will be bigger. Developer George Diamond gets ready to water some trees. Among the notable features: Big, wide porches.